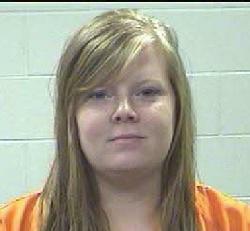 Melissa Joan Smalley, 25, of Corrigan is facing three felony drug charges. Corrigan Police Make Drug Bust, CORRIGAN, July 25, 2013 - On July 24, 2013, Corrigan Police Department executed a search warrant at the residence of Melissa Joan Smalley, 25 of Corrigan who resides at 116 Bluebonnet Circle, apartment number 82. Narcotics Officer, James Hight, Chief Darrell Gibson, Sergeant Patrick Marek, Officer Javier Segura, and Officer Harold Rapsilver conducted the search at Smalley's residence. The search warrant was issued as a result of an investigation into possible narcotic sales. Smalley was arrested after being pulled over in her 2006 Chevrolet Malibu by Officer Javier Segura. Smalley possessed narcotics in her vehicle. The investigation and searches resulted in three felony counts against Smalley. Corrigan Narcotics Officer, James Hight arrested Smalley and charged her with three felony counts of possession of a controlled substance. These searches yielded 25.2 grams of a controlled substance in Smalley’s residence and less than one gram of the same narcotic in her vehicle. Officers gather outside Smalley's door as they prepare to execute a search warrant. Corrigan Police Chief Darrell Gibson and Officer Harold Rapsilver load Smalley into a patrol unit. Officer Hight (left) and Chief Gibson display the evidence confiscated from Smalley's apartment. Sergeant Patrick Mareck weighs the evidence. Judge Wayne Yankee (left) and Officer James Hight finalize paperwork for charges against Smalley. Smalley's 2006 Chevy Malibu was towed by Clifton Chevrolet.